Kris Dunn is the exciting rookie, Karl-Anthony Towns is thought to be a franchise player. But will the key to how much the Wolves improve be the play of Andrew Wiggins? Kris Dunn is the exciting new Wolves rookie. Karl-Anthony Towns, at least according to NBA GMs, is the team’s franchise player — the one they would pick from the entire league right now if they were going to take one player to start a team. Zach LaVine is the super-athletic dunk champion. Ricky Rubio is the floor general. But maybe, just maybe, Andrew Wiggins is the key to just how far the Wolves will go this year and beyond. He was the NBA’s top rookie two years ago and took a small step — but not a leap — forward last year. There doesn’t seem to be a clear consensus as to where his ceiling is — a nice wing but a volume scorer? An All-Star once or twice? A superstar? — but this is year three and those answers should start to come into focus. Wiggins’ presence at the team’s media day a few weeks back suggested he’s emerging as a team leader along with Towns. But more important will be his play on the court — and while every NBA player works in the offseason in some way to stay sharp, a video that went live Tuesday of Wiggins’ summer work indicates a level of focus and intensity aimed at achieving greatness. 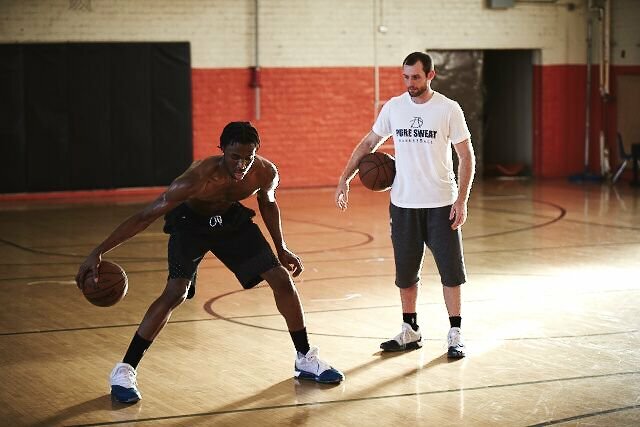 In “Unseen Hours,” Wiggins is seen working with Drew Hanlen of Pure Sweat basketball. The 3-minute video (embed below and link here) is primarily a montage of moves, drills, instruction, shots and dunks, but the accompanying words (captioned, which is always a bonus) provide some extra insight into the process. Improvements in those areas are necessary. Wiggins went from 16.9 ppg as a rookie to 20.7 ppg last season in large part because he simply shot the ball more. He attempted 2.1 more field goals and 1.3 more free throws per game. While his Effective Field Goal Percentage (taking into account the value of three-pointers) trended up a notch from 45.4 to 48.1, he still ranked just 90th in the NBA in that category. LaVine, by comparison, was at 51.6 (45th) and Towns was at 55.5 (14th). Wiggins also shot a lower percentage on three-pointers (30 percent compared to 31 percent) last year vs. his rookie year, albeit in more attempts. His assists, steals and blocks were static from year-to-year (and not overly impressive to begin with), and he had one fewer rebound per game last year than his rookie year. Improvements on his ballhandling, shot mechanics and scoring versatility would at least give Wiggins the ability to become a more efficient scorer — which would be a very nice step in his game, and allow him to chip away at some of those other areas in subsequent offseasons. While it’s hard to get a perfect gauge of a person’s work ethic in a short video designed to promote that player, it appears Wiggins isn’t averse to work. At one point, he pushes through exhaustion during a drill as Hanlen implores him to do it five more times. With the first Target Center preseason game set for tonight and the start of the regular season one week away, we’ll see how far it takes him.